It's been a while since I've dove into some new music, especially that of some pop punk; since there have been so many releases in the past couple of months, I haven't really been able to catch up. When I was offered to check out the not-so-small-sounding Smalls out of L.A., I was truly taken aback. It's almost as though I was transported back to my angsty middle school/high school years. This EP, which is entitled Expecting the Worst, is something really else, for the fact that you can really see its influences and where it gets its spazz from. The layout of music reminds me of dueling vocals a-la old school Taking Back Sunday and Brand New, and it's always nice to hear the constant battle of angry and sad vocals that really like to punch at the heart. What makes it for me, though, is the blend of the traditional vocal style with the now popular fast-paced pop punk. The music is filled with fast-paced circle pit running/parts to dance in the pit, all while hating your life but making the best of what you have (at least that's what I picked up from the lyrics). My only real compliant I found about this EP is the amount of songs. I would've killed to have just one or two more songs. It feels like as soon as it has gained full steam, you're left hung up wanting more and the EP is long done. Some of the best finds musically for me are the bands you've really never even heard of. 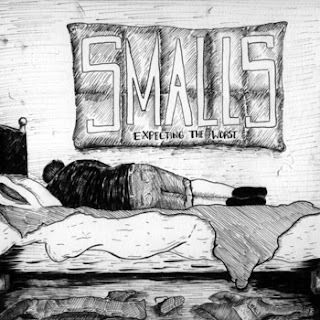 I had never heard of Smalls before today, but Expecting the Worst really caught my attention and I'm excited to hear what else these guys – and girl – bring to the table! Be sure to give them a like on Facebook and pick up this amazing EP.